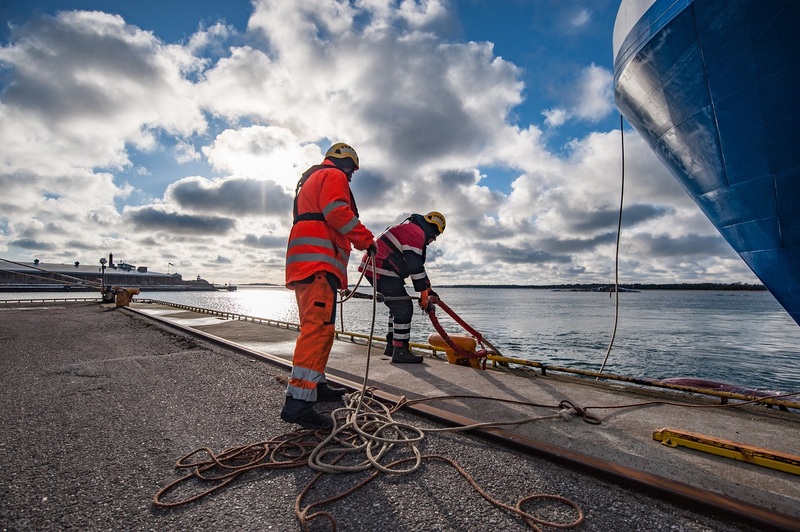 In the Port of Hanko safety comes first. With the safety regulations we strive to guarantee the safety for all those who operate in the harbour. Beside the safety regulations we also see that the preconditions for a smooth operation are in place. The speed limit in the harbour area is 30km/h. Parking is allowed only in P-marked areas or parking lots. General traffic rules and signs are complied with in the harbour area. Violation of these or other regulations result in a warning and may also result in the passer permit being temporarily or permanently revoked. Beware of level crossings and avoid moving about on foot. Moving from one part of the harbour to another should primarily be done by using traffic routes in the hinterland. Avoid moving about on the quay areas. The quayside is meant only for activities connected with the vessel or work done by the stevedore companies. All other traffic is prohibited in the areas mentioned above. Recordable camera surveillance is used in the harbour area and regular patrols are made in the area. Minimize damages – use protective gear! When moving in the harbour area use CE-marked highly visible protective clothing (EN 471) and protective footwear (EN ISO 20345). When moving near suspended weights you should also use a helmet (EN 397). Concerning personal protection (Vna 633/2004) always also abide to the regulations given by the company, which has issued the passer permit. Photographing within the harbour area is only allowed with permission of the Port Authority. Make an emergency call if you are in acute need of help from the authorities, or when you know or suspect that the life, health, property or environment is threatened or in danger.